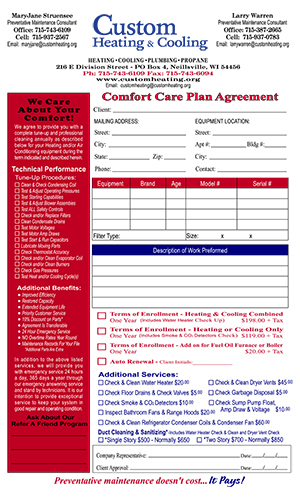 We agree to provide you with a complete tune-up and professional cleaning annually as described below for your Heating and/or Air Conditioning equipment during the term indicated and described herein. In addition to the above listed services, we will provide you with emergency service 24 hours a day, 365 days a year through our emergency answering service and stand by technicians. It is our intention to provide exceptional service to keep your system in good repair and operating condition.